Genoa was named after Genoa, Italy, since it was founded and settled by persons of mostly Italian descent. It was established in 1854, originally platted as Bad Axe City. Prior to settlement by those of Swiss and Italian descent, several Indian tribes, mostly Winnebagos, settled along this Mississippi region where they found fishing and hunting plentiful. The oldest known white settler on the site of this picturesque river town was David Hastings, who erected the first house in 1853. Genoa was the location of a steamboat landing, which was referred to as Hastings Landing. In addition to river and rail commerce, early industry included two clamshell button factories and occupations of limestone quarrying (see photo). 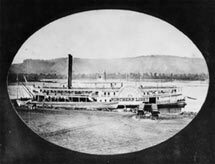 Early residents depended on the Mississippi for livelihoods, as well as for news from the outside world, in a time when steamboats provided the only form of communication and transportation. In 1884, the Chicago, Burlington & Northern Railroad completed its route through Genoa. It offered freight and passenger service for the residents and gave the village much closer access to the larger city of La Crosse. Passenger service gave way to the automobile in the early 1930's and freight service was ended in the early 1960s. The first public school (early 1900s) was in the building that is now used as the American Legion Club. In 1909, the first school building of brick went up and was used until 1952. In 1925, a convent was built for two Franciscan Sisters, who took over the teaching at St. Charles. The new school was built in 1951 and is still in use for grades 1 through 8. St. Charles Catholic Church was organized in 1862, and a church edifice was erected two years later. Before the first church was built in 1864, mass was offered in the Bartholomew Starlochi home. On August 15, 1901, the cornerstone was laid for the new church. In 1919, a chapel was built at the top of the cemetery, in memory of local men from WWI. In the early days, the Mississippi River varied from a wide lake to a stream that permitted wading across in some areas. In the early 1900s, a number of wing dams were built as part of a program to channelize the river flow to a 6-foot depth between Minneapolis and St. Louis. In 1930, Congress authorized the present 9 foot channel and the construction of Lock and Dam #8. The work began in 1934 and progressed for several years. In 1937, it was completed and put into operation. The main lock chamber is 110 feet wide and 600-feet long and is filled and emptied by gravity. The lift or difference between the upper and lower pools is 11 feet. It takes 5.5 million gallons of water to fill the lock. The Dairyland Power #1 coal-fired power plant was built in Genoa in 1940. In August of 1966, Dairyland Power began construction of its 350,000 KW steam plant at Genoa, referred to as #3, because it was the third contiguous plant building on the original site. It was placed in commercial operation on July 16, 1969. In 1967, Dairyland built the La Crosse Boiling Water Reactor (LACBWR) in Genoa as part of a project with the federal government to demonstrate the peacetime use of nuclear power. This reactor was shut down in April 1987. This page is reprinted from www.grandexcursion.com with permission from the original writer, Ellen Finch of Genoa, Wisconsin. All rights reserved by the owner. Workers at an early Genoa limestone quarry. Many Italian immigrants worked in quarries. This early steamboat, the Northern Light, sank near Genoa. Photo courtesy of Pat Rash.